Print Ads 1/6 and larger get a Director y Listing and Editorial Opportunities for FREE Discounted	ad	prices	are	based	on	a	multi	month	contract	(consecutive	placements	and	payments). Ad	design	available	at	additional	charge. Call	or	text	505-386-7720	or	email	Publisher@NaturalAwakeningsNM.com. Finally a place you can find a full spectrum of therapeutic massages under one roof! Beginners - Advanced All Welcome! Now in our 7 Year! ADVERTISING & SUBMISSIONS HOW TO ADVERTISE To advertise with Natural Awakenings or request a media kit, please contact us at 505-386-7720 or email Publisher@NaturalAwakeningsNM.com. Deadline for ads: the 15th of the month. EDITORIAL SUBMISSIONS Deadline for Articles: the 5th of the month. Deadline for News/Health Briefs: the 15th of the month. Email to: Editor@NaturalAwakeningsNM.com. CALENDAR SUBMISSIONS Submit Calendar Events online at: NaturalAwakeningsNM.com/submissions/ Deadline for calendar: the 15th of the month. REGIONAL MARKETS Advertise your products or services in multiple markets! Natural Awakenings Publishing Corp. is a growing franchised family of locally owned magazines serving communities since 1994. To place your ad in other markets call 505-386-7720. For franchising opportunities call 239-530-1377 or visit NaturalAwakeningsMag.com. Mr. Raphael was a Hypnotherapist in the 4year study funded by the National Institutes of Health and conducted at University of New Mexico where it was scientifically proven that integral Hypnotherapy was both effective and in many cases a superior form of treatment for overactive bladder and urinary incontinence. Ask	your	medical	provider	about	integrating	hypnotherapy	into	your	treatment	of	overactive	bladder	or	urinary	urgency. To Schedule a FREE Consultation Call Now! Welcome April, Bring on the Spring Weather. his was a fun issue to put together, there is a lot going on in the communities with new classes, workshops and concerts; those are detailed in our Event Briefs. And, the Taos Environmental Film Festival is coming. The timing of all synch with an article on creative arts therapy where expressive therapies are described as an extension of self-discovery. We have profiled two long-standing members of the Natural Awakenings community in Practitioner Profiles. 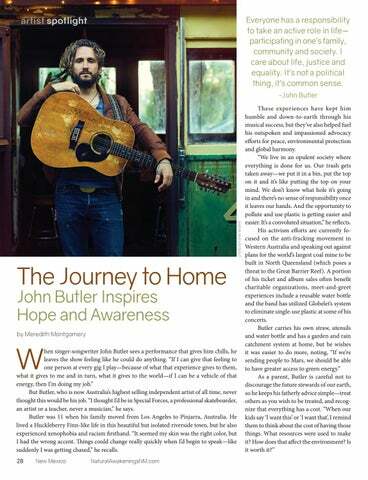 And, I’m especially excited about an Artist Profile on John Butler. I’m a little star struck, a sister publisher, Meredith Montgomery, had an opportunity to interview John and graciously shared the piece for us in New Mexico. Thank you, Meredith! Our feature article covers living off the grid which is becoming more economical as solar power costs plunge. This is great for New Mexico as one of the sunniest states. And, writing of sun, enjoy the article on hiking for health and happiness. After enjoying a hike, consider sharing a healthy home-cooked meal with strangers, colleagues and friends to buck the growing trend of eating alone. Break some bread, glutenfree or otherwise. Don’t forget to check out the Wellness Tour held April 11-13, tour stops and specifics will be listed on our website. It’s a great way to learn about services and meet providers. Enjoy! Publisher@NaturalAwakeningsNM.com 505-386-7720 SUBSCRIPTIONS Digital subscriptions available, sign up for free at our Website NaturalAwakeningsNM.com Print subscriptions available through mail $30 for 12 issues, contact us using information above. © 2019 by Natural Awakenings. All rights reserved. Although some parts of this publication may be reproduced and reprinted, we require that prior permission be obtained in writing. 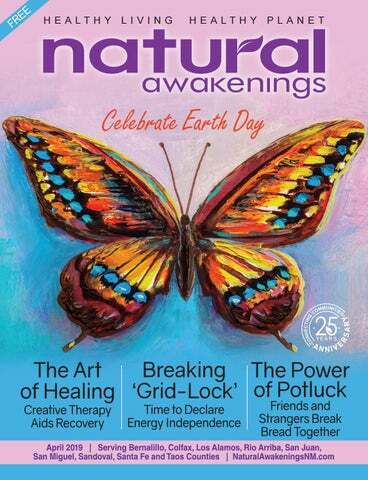 Natural Awakenings is a free publication distributed locally and is supported by our advertisers. Please call to find a location near you or if you would like copies placed at your business. We do not necessarily endorse the views expressed in the articles and advertisements, nor are we responsible for the products and services advertised. Check with a healthcare professional regarding the appropriate use of any treatment. Rosie's Ruminations and Rudy's Raps: "Story, Music, Poetry and Zen Twists on Love & Duality"
he Hypnotherapy Academy of America in Albuquerque is excited to announce a special free, two-hour class being held at 7 pm on April 10. The class will be facilitated by Tim Simmerman Sierra, lead instructor at the Academy, who will be sharing three secrets to create positive life changes by showing attendees how their subconscious mind works. “Feeling stuck, blocked or stagnant originates with limiting thoughts held at the subconscious level. Learn how the techniques taught at the Academy are specially designed to liberate you from those thoughts and help you lead a more fulfilling life – enjoy more peace of mind and a joy-filled heart,” says Sierra, who will also present recent scientific research on Hypnotherapy Academy methods being used by the National Institutes of Health and will also discuss hypnotherapy as a career. “Integrate your interest in healing, the mind science and practical spirituality into a career helping people as a hypnotherapist.” Sierra has been Director and award-winning lead instructor at the Academy for 23 years. He is a former two-term President of the American Council of Hypnotist Examiners. He is also on the Board of Director for the International Board of Hypnotherapy, and the author of the definitive textbook, Medical Hypnotherapy, Principles and Methods of Practice. See Ad on page 10 for venue details or see www.SRBY.org. Call 505-767-8030 to register and reserve your seat for this special free class. See ad, page 7.
auren Johnston is bringing a powerful workshop to Santa Fe on May 2-5th. The workshop is based on the Law of Attraction and teaches participants how to stay open and receive what they are working to attract. “The only way to get where you want to be is to resonate with what you want, trust you will get it, and be in the receiving mode,” says Johnston. “This workshop will deepen your receptive state and break through hidden barriers that are stopping you.” Johnston is a Life Coach and Certified Practitioner of Resonance Repatterning and will take 20 participants for this workshop. Go From Blah to Bliss! he Church of Light will hold its bi-annual Conference titled, A Hermetic Sampler from June 21-23 at The Best Western in Old Town, Albuquerque. Friday kicks off in the morning with a pre-conference talk entitled, “In Search of Zanoni: a mystery”. Speakers will cover Medical Astrology, the Egyptian Tarot Deck, and Alchemy: How to get what you want on Saturday. The evening’s entertainment will be a Native dance troupe from the Zuni Pueblo. Speakers on Sunday will cover Planetary Cycles, King Solomon’s Lodge and The Seven Principles of Hermeticism. The full conference price includes lunch and dinner on Saturday and lunch on Sunday. During the conference, you will also have an opportunity to purchase the unique Church of Light Astrology program, various metaphysical books or receive a tarot reading or astrology chart interpretation from a member. nes Maricle, a Vocal Sound Healing Practitioner, is holding a workshop on May 5th in Santa Fe. In this workshop, Maricle will share how to use intuitive vocal expression and vibration to disrupt negative programming and transform mind/emotion/energy patterns into resonant states for optimal wellbeing. Sound journeys and group exercises will allow participants to find their true voice and release wounds. Originally from France, Maricle recently moved to Santa Fe from Seattle where she lived for twenty years, working as a dancer, choreographer and sound healer. She also performed with the sound healing trio, Luminosas. Watch for her around town as she gets to know the community and offers her workshops, readings and concerts. Welcome Ines! For more information check out the Light.org website or call 505-247-1338. See the event ad and calendar listing for more details or call 206-407-5878. Book by April 30, Use Any Time! Baba is a masterful teacher who draws from his own experience of Self Realization to impart Self Knowledge and to clarify questions on meditation and spirituality. Learn and practice meditation with a true Master. Programs are free - donations appreciated. By mixing food additives with human gut microbes in petri dishes, scientists at the Czech Republic’s Institute of Microbiology found that gut microbes with antiinflammatory properties were highly susceptible to being harmed by additives, while microbes with pro-inflammatory properties were mostly resistant. “We speculate that permanent exposure of human gut microbiota to even low levels of additives may modify the composition and function of gut microbiota, and thus influence the host’s immune system,” wrote the authors. Smoking Bans Lower Blood Pressure Non-smokers that live in areas that have banned smoking in public spaces such as restaurants, bars and workplaces have lower systolic blood pressure. In a Northwestern University study reported by the American Heart Association, blood pressure readings of 5,115 adults ages 18 to 30 in Birmingham, Chicago, Minneapolis and Oakland were taken over a 30-year period and correlated with changes in local laws that banned public smoking. A meaningful decrease in systolic blood pressure readings was found in non-smokers when no-smoking laws were enacted, indicating a reduction in heart disease risk. Probiotics Ease Bipolar Disorder Research on 66 patients with bipolar disorder found that patients receiving probiotic supplements were three times less likely to be rehospitalized than those given a placebo. The study from the Sheppard Pratt Health System, in Baltimore, gave half of discharged patients a placebo and the other half a capsule containing two probiotics, Bifidobacterium lactis (BB-12) and Lactobacillus rhamnosus GG (LGG). Within 26 weeks, 24 of the 33 people that received the placebo returned to the hospital, but only eight of the 33 on probiotics were readmitted. The probiotic treatment was especially effective for those experiencing considerable inflammation, say researchers. FORGIVENESS & RENEWAL: A Spring Retreat with Horses No horse experience needed. Unmounted . t is early April and you just got off your flight after sitting between two people who were hacking all over you on the plane. Dehydrated and tired you get your luggage and head for your car! Even with this short walk to the parking garage, you experience a 21 mile an hour wind head-on. Less than a week later, you begin to sneeze, your eyes water, your nose feels congested and runs, while your throat begins to itch. At this point you ask yourself, is this a cold or just allergies? Take a moment! Ask yourself: where am I living / visiting? What time of year is it? Many people today have a heightened sensitivity to an allergen of some kind (pollen, dust, mold, including food...) which causes the immune system to overreact in order to defend itself. Traveling alone can weaken your body causing an exaggerated reaction to recycled air from people, and their pets, with a variety of other health considerations. It can be easy to fall off your normal diet. Rushing to catch a connection might force you to grab that fast-food bread full of wheat and yeast, a salad with dairy or health bars made with lots of sugar and peanuts. People with allergies recognize their immune system is triggered, working overtime even with relatively harmless exposure, like the wind as early March. For the average person, their reaction can be mild discomfort, although for some it can be a life-threatening situation, so learn to listen to your body and respond appropriately. Most people with allergies find their symptoms can be very similar to the flu without a fever. A combination of symptoms can include: watery eyes; runny nose; sneezing; itchy throat; nasal congestion; wheezing; fatigue; coughing; stomach ache; fatigue; irritability; and skin irritations. Allergies have been categorized as hay fever, eczema, hives and asthma all due to a person’s reaction to something. Here are some top questions to ask yourself: Was I exposed to something in the air? ...pollen, pet dander Did I get stung, bitten by an insect? …venom of bees and wasps or bed bugs from the hotel Was I near any chemicals? …synthetic perfumes Did I drink enough water? …not soda or alcohol What have I eaten differently? Did I recently change my medication? Was my trip traumatic or stressful? The answers to these questions can help guide you to determine if you need to go to your doctor. In my 25-PLUS years of practice, I have offered natural solutions that are proven and work naturally for people with allergies. Here are my favorites: •	Acupuncture – Decreases inflammation and supports the endocrine system (adrenals, thyroid) and fortifies the detox organs (liver, kidney, lung and spleen). •	Chinese herbs and Homeopathy - Histoplex, Xanthium Relieve Surface, Jade Screen or Allergena 6, Juniper 200x homeopathic (that you can begin a month before the season begins for quick results). •	Nasal sprays – RestoreTM Sinus Spray and Ozone Nasal Insufflation can help to clean out the sinus cavity. •	Eye drops – Lubrisine Eye Drops helps to soothe itchy, burning eyes. •	Diet therapy – A simple blood test can reveal a complete list of foods to avoid. Are you ready to take charge of your health naturally? We are here for you by calling 505-986-1089 M-F 8 am – 5pm MST or emailing us at manager@ santafesoul.com . Revered Sorceress of Song & Sound, Marie Black combines her lifelong paths of Music and Energetic Healing to guide you on a deeply restorative healing meditation with Tibetan Singing Bowls and Soft Percussion as her multitimbral voice smoothes the energies intuitively with non – linguistic tones focusing intention, leading you to balance. Support Citizen Action Against Plastics Every minute, the equivalent of an entire garbage truck of plastic gets dumped into our oceans, reports the World Economic Forum. Many of the materials are disposable, single-use plastic products like straws, bags and Styrofoam containers, which some cities and towns have banned. This type of citizen action is increasingly blocked by the Plastic Industry Association (PIA), which has spent big money to successfully ban plastic bag ordinances in 10 states where 70 million Americans live. This means local communities are prohibited from taking effective action that could reduce the plastics that litter our streets and pollute our waterways. The Sierra Club is calling on nine major corporations that are members of the PIA to withdraw from it with an online petition. So far, two have indicated they will not be renewing their memberships this year: Clorox (which owns companies like Burt’s Bees, Brita and Glad) and the Ascena Retail Group (which includes Ann Taylor and Loft). To participate, sign the online petition at Tinyurl.com/PlasticPollutionPetition. Other action steps, including tweeting and involving friends, are also detailed. vantages are lower upfront cost and access to the grid when needed. Connecting to the grid makes sense for all alternative power sources, because wind and solar are intermittent, and don’t always provide power. Also, most states offer net metering, which requires the local utility to pay for the electricity a homeowner puts back into the grid. Solar: Plunging Costs Solar panels for electricity, usually made of silicon, consist of photovoltaic cells that convert sunlight into direct current (DC). Their cost has come down dramatically in recent years. In January, the average solar panel cost $3.14 a watt, a bottom line of roughly $18,000 with a six-kilowatt system big enough for most homes. The price fell 6.5 percent from January 2018, reports EnergySage.com, a solar vendor pricing source. A federal tax credit covers 30 percent of the cost, so the out-of-pocket cost for a system would be approximately $13,000 if installed before year’s end, when the full residential tax credit is available. Partial tax credits will be available until they are phased out in 2022. Ron Blumenfeld, a retired doctor in Fairfield, Connecticut, serves on his town’s sustainability task force and “went live” with his rooftop installation six years ago. “It’s turned out to be one of the best investments we’ve ever made—financially and environmentally,” he says. The U.S. Department of Energy (DOE) is working toward residential solar to generate power at just five cents per kilowatt-hour by 2030, which means it will be far cheaper than grid electricity. Consumers can either buy a system outright or—as a popular alternative—lease the system with no upfront costs. Leasing companies like SolarCity (now part of Tesla) pioneered this approach, in which consumers agree to buy electricity from the system installed on their roof. Whether to add the extra expense of battery backup is important. A pair of Tesla Powerwalls will cost about $14,000 installed and store enough electricity to power a home for seven days. It’s suitable for people looking to go off the grid because the sun doesn’t always shine, and power generated on sunny days can be stored and used when it’s overcast. Off-the-grid solar is not just for those living in sun-rich states. Installers can look at a property—often remotely, through applications like Google Earth—and determine if solar is appropriate. Sometimes a few trees will have to be sacrificed, but the benefits are manifold, and not just because there will be power during grid blackouts. Residential wind power is in its infancy in the U.S. have taken down many projects (including Cape Wind, in Massachusetts). With annual maintenance, the DOE reports that small wind turbines should last about 20 years, the same basic lifespan as solar panels. The federal production tax credit for wind is available this year, but won’t be available afterwards. Some states offer incentives. A useful small wind guidebook can be found at WindExchange. Energy.gov/small-wind-guidebook. a home, combining heating and air conditioning in one system. While it necessitates a relatively high upfront cost, low operating costs mean the systems can pay for themselves in less than 10 years. Most include a ground-source heat pump with a 50-year warranty. For a 2,500-square-foot home, an average offthe-electrical-grid system will cost $20,000 to $25,000 to install. Bill Martin, in Quincy, California, runs an efficient three-ton geothermal system installed in 2014. “It’s been a very good experience,” he says. “I’m ecstatically happy.” The same 30 percent federal tax credit that applies to solar also applies to geothermal for systems installed by 2020. States also provide incentives. A detailed guide on availability is available at Tinyurl.com/ GeothermalHeatPumpListing. “Back to basic”, learn how to improve your body, emotional and spiritual health using natural ways and remedies. Improve your weight, sleeping, breathing, physical activities and mind with natural health solutions. ood revolutionary Ocean Robbins has dedicated his life to inspiring others to rethink their food choices to transform both personal and planetary health. It’s a path forged in part by his father, John Robbins, who walked away from the family ice cream company, BaskinRobbins, to become an acclaimed health advocate and author. Together, father and son founded the 500,000-plus-member Food Revolution Network, an online education and advocacy platform that works for healthy, sustainable, humane and delicious food for all. Ocean launched Youth for Environmental Sanity (YES!) at age 16, and directed the organization for 20 years. Ocean’s new book, 31-Day Food Revolution: Heal Your Body, Feel Great, and Transform Your World, aims to help individuals revamp their diets, and in turn, themselves and their communities. It distills his lifetime of knowledge and wisdom on food, health and activism into an accessible how-to guide. Learn more at 31DayFoodRevolution.com. choices that are best for us personally also happen to be best for the planet. Eating a plant-based diet, organically grown when possible, is not only linked to the best statistical outcomes for long-term health and well-being, it also helps ensure healthy topsoil, water and a stable climate for future generations. Start by finding out if you have loved ones who do share your food values, and nurture those relationships. Lean into those healthy relationships; you might be surprised how many people around you are also quietly trying to achieve similar goals. You can also ask friends and family to be a food ally; even if they are not a full participant in your health regimen, they might be a fan or friend. That can mean preparing particular foods if you come for dinner or simply checking in on how you are doing with your goals and commitments. You can widen your circle of healthy eating through meal swaps or other shared meal programs. It’s always easier to cook in larger quantities, and there is the added benefit of greater social connection with shared meals. If you are looking for new friends and allies, it helps to connect to organizations that are already promoting healthy food hubs. There are many listed in the back of 31-Day Food Revolution. So many people struggle with loneliness, and some are afraid they will feel even more isolated if they step out into a healthy eating regimen. On the contrary, you can become a magnet for people who care about their world and aren’t content with the status quo. These friendships can often become deeper and more valued than ever. acred space is most often associated with places of worship, but it can be any place that connects us to meaning or joy. In the blur of daily living, nooks of inspiration and beauty provide spiritual sustenance, remind us of our dreams or celebrate lovely memories. Having “bliss corners” in the home or workplace is a wonderful way to stay connected to the positive. Most parents or grandparents can confess to having a bliss corner on the refrigerator door where drawings and accomplishments of young family members are proudly displayed. Having a place of inspiration in any room doesn’t have to take up much space and can easily add to the décor. It can be as simple as a wedding veil hanging on a bedroom wall or a bowl of shells, sea glass or sand from a beach vacation in the bathroom. It can be sentimental with dried flowers from a momentous occasion or a small table dedicated to loved ones with framed photos or letters and a piece of cloth that holds special memories. Corners of bliss fulfill their purpose best in places where they can remind us to follow our heart’s “true north” or help us to foster inner peace during busy days. Such places are office desks and bedroom nightstands near an alarm clock. The kitchen is an ideal room in the house for sacred space; designating a corner to light a candle during meal prep; filling an old teapot with fresh flowers every week; and displaying the photo of someone who once nourished us are all beautiful ways to bring more meaning into our relationship with food. Cultivating bliss can be a form of active meditation, simple rituals that can include prayer or other forms of mindfulness. On more practical levels, it can be an opportunity to bond with loved ones. Creating a bliss corner can be a creative and fun activity for teens to express a passion, whether it be a hobby, sport or favorite singer. Many of us have boxes of mementos or nostalgic things from childhood taking up space in a closet. Making a bliss corner is the perfect way to remind us why we kept them in the first place. mericans are eating alone more than ever, with adults going solo for nearly half of all meals, according to consumer research consultants at the Hartman Group. Yet, fellowship-minded foodies are bucking the trend by finding new and unique ways to bring strangers, colleagues and friends together for healthy, home-cooked meals. Meal sharing not only builds community and camaraderie; it can also save time and money and minimize food waste. Eating with others can also encourage mindful consumption, a boon to physical and mental health. A number of emerging ideas and platforms from around the block to across the globe are helping singles and families young and old connect over food. ~Jay Savsani, co-founder of Meal Sharing mushrooms, wild rice and fish sourced from fields, forests and streams. On a more grassroots level, an intergenerational family potluck dinner “helps create community and a sense of family among people who often live far from blood relatives,” says Fuquen, who lives on a small farm outside Charlottesville, Virginia. The workplace can also be a great place to break bread together, says Fuquen. Her office enjoys hosting the Souper Club, where co-workers each bring a key element like salad fixings, a loaf of bread or a pot of soup to enjoy together—away from their desks. Rebecca Shaloff, a fundraising consultant in Washington, D.C., has participated in work lunch swaps, which she says promote camaraderie, new food discoveries and healthy eating. She also takes part in a closely knit monthly supper club of four young families in her neighborhood. “We all value each other’s friendship and company, but there’s something about coming together for dinner that makes us feel more like family than friends,” Shaloff says. Connect with freelance writer April Thompson, of Washington, D.C., at AprilWrites.com. Use Hypnotherapy to Live a Healthier Lifestyle Call Now for a Free Consultation! 505-382-4413 • AllisunHullHypnotherapy.com Allisun Hull CCHT. IBH Certified. or decades, creative expression has been a valuable tool in healing, and expressive arts therapy—the integrated application of two or more art forms—is now considered a life-changing modality for veterans and anyone else struggling with anxiety or post-traumatic stress disorder (PTSD). Also called creative arts therapy, this form of psychotherapy helps patients to process and express what is often beyond verbal language using music, art, dance, theater and writing as its primary modes of communication. “Individuals need no previous arts experience in order to benefit from working with a certified creative arts therapist,” explains Azizi Marshall, founder and CEO of the Center for Creative Arts Therapy, in Downers Grove, Illinois. The National Intrepid Center of Excellence—an outpatient clinic specializing in traumatic brain injuries at the Walter Reed National Military Medical Center, in Bethesda, Maryland—ranks creative arts therapy among the top five most effective approaches in helping veterans. A study of combat veterans and creative arts therapy conducted at Concordia University, in Montreal, reported considerable progress, especially in areas of expressing emotions resulting from trauma and gaining understanding of symptoms such as depression, thoughts of suicide and insomnia. The multitasking neurotransmitter dopamine is one of the brain’s natural antidepressants and plays a key role in feeling pleasure and reinforcing habits. It reaches its highest levels during the initial stages of love, observing something of beauty or creating art. A recent Drexel University study published in The Arts in Psychotherapy shows the neurological effects of drawing, coloring and simple doodling. Increased circulation in the area of the brain correlating to pleasure and reward was evident, and this dopamine-dominant response is responsible for decreasing symptoms of anxiety and increasing feelings of joy and accomplishment. Psychotherapist Doreen Meister, in Oakland, California, encourages her clients to focus on the process of creating, rather than the result. “Expressive therapies are an extension of the selfdiscovery continuum. I often hear, ‘I draw like a 2-year-old.’ To this I say, ‘Great! Draw like a 2-year-old!’ I believe that somewhere, many of us are told that creative expression must be a certain way. Creativity is a natural state, a human quality that we are born with, and the product of creation is not as important as the process.” Creativity from a clinical perspective allows for new emotional vantage points, distance from situations and viewing experiences through a different lens. “Bringing in creativity offers a wider palette of tools or access points, and gives us another way to understand ourselves,” says Meister. “Creativity as a life force is accessible to all of us.” Marlaina Donato is an author and composer. Connect at AutumnEmbersMusic.com. Call now to sign-up for a FREE 20-minute consult today! any of us Walking and hiking Individuals in the study equate fitness that walked six hours a balance the body with going week lowered their risk through natural move- of dying from cancer to the gym, but a good ment, oxygenation hike in a natural environand cardiovascular and ment can foster unique respiratory disease. It of the cells and the benefits for both body also shows that just two use of our muscles and psyche. as they were designed hours of walking per Hiking or walking week could significantly to be used. outdoors not only proimprove health. motes heart health, help“Walking and hik~Dami Roelse ing to balance both blood ing balance the body sugar and blood pressure, it increases hip through natural movement, oxygenation bone density to help reduce fractures, of the cells and the use of our muscles according to research on postmenopausal as they were designed to be used,” says women from the ongoing Nurses’ Health Dami Roelse, of Ashland, Oregon, author Study. Navigating uneven terrain also of Walking Gone Wild: How to Lose Your necessitates lateral movement, which can Age on the Trail. “Walking is in our genes; strengthen core muscles and improve balDNA molecules need to be stimulated ance more significantly than working out regularly to express themselves, and walkon a treadmill or cycling. ing does just that. It also improves mood and cognition.” Walk and Live Longer The beauty of hiking is that it offers Any kind of walking can be a great boon a tailored experience according to ability to health. Recent research by the Ameriand personal interests. Day hikes, whether can Cancer Society involving 140,000 in the countryside or in urban botanical older adults correlates a lower mortality gardens or parks, are uplifting and ideal for rate with even short intervals of walking. any fitness level. Helpful Links and Inspiration National trail guide resource: AllTrails.com 13 best hiking apps: AtlasAndBoots.com/best-hiking-apps Hiking with the kids: Tinyurl.com/HealthyHikingWithKids Beginning with day hiking: SectionHiker.com/10-tips-forbeginner-day-hikers Backpacking tips for beginners: REI.com/learn/expert-advice/ backpacking-beginners Practical advice, inspiration and tips for women hikers: GirlsWhoHike.net Walking to stay fit: VeryWellFit.com/walking-4157093 Library of forest bathing articles: TheForestLibrary.com/forestbathing-online-articles measured while viewing urban and forest scenes. My blood pressure was lower after every walk, and my brainwaves calmed while viewing forest scenes.” Choukas-Bradley emphasizes that forest bathing doesn’t require a forest setting, noting, “You can forest bathe in the desert, at the beach or even an urban park during a lunch break.” Hitting the trails can also help us see life from another perspective. “Forests are living, breathing organisms. Mountains transcend my humanness,” muses Roelse. “It’s both a humbling and uplifting experience.” Marlaina Donato is the author of several books on spirituality and clinical aromatherapy. She is also a composer. Connect at AutumnEmbersMusic.com. Everyone has a responsibility to take an active role in life— participating in one’s family, community and society. I care about life, justice and equality. It’s not a political thing, it’s common sense. Centered around John Butler’s virtuoso guitar stylings and powerful, progressive lyricism, the John Butler Trio draws upon a remarkable variety of musical genres, spanning folk, blues, funk, classic rock ‘n’ roll and beyond. 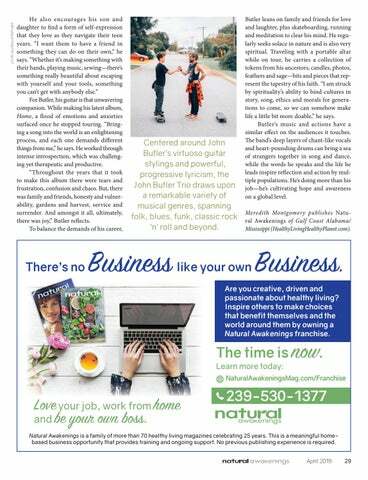 Butler leans on family and friends for love and laughter, plus skateboarding, running and meditation to clear his mind. He regularly seeks solace in nature and is also very spiritual. Traveling with a portable altar while on tour, he carries a collection of tokens from his ancestors, candles, photos, feathers and sage—bits and pieces that represent the tapestry of his faith. “I am struck by spirituality’s ability to bind cultures in story, song, ethics and morals for generations to come, so we can somehow make life a little bit more doable,” he says. Butler’s music and actions have a similar effect on the audiences it touches. The band’s deep layers of chant-like vocals and heart-pounding drums can bring a sea of strangers together in song and dance, while the words he speaks and the life he leads inspire reflection and action by multiple populations. He’s doing more than his job—he’s cultivating hope and awareness on a global level. Meredith Montgomery publishes Natural Awakenings of Gulf Coast Alabama/ Mississippi (HealthyLivingHealthyPlanet.com). Are you creative, driven and passionate about healthy living? Inspire others to make choices that benefit themselves and the world around them by owning a Natural Awakenings franchise. THURSDAY, APRIL 11-13 Natural Awakenings NM Wellness Tour \Various Times and Various Locations, find Practitioners on our website NaturalAwakeningsNM.com/wellnesstour. Free. Contact Practitioners for more details. WEDNESDAY, APRIL 10 Free Class at Hypnotherapy Academy– 7pm. The class will be facilitated by Tim Simmerman Sierra, lead instructor at the Academy, who will be sharing three secrets to creative positive life changes by showing attendees how their subconscious mind works. Call 505-767-8030 to register and reserve your seat for this special free class. 2132 Osuna Road, NE, Suite B, Albuquerque. DreamVision - Journey of Discoveries. 10:3012:00pm In a safe and nurturing circle we’ll journey into the dream real aided by the sound of the drum and didgeridoo. You’ll learn what the soul wants, where it has gone and can go. This can reveal wishes of the soul, sacred contracts, knowledge & help of guides and spirits. Questing for self-healing and transform soul wounds from grief, pain, anger, and shame into sources of power and wisdom. Wellness Within, LOCATION Prana Blessings 1925 Rosina St., Unit C, Santa Fe RSVP Laurie Wheeler 505772-0970 Donation $45 - bring a journal & blanket. SATURDAY, APRIL 27 DreamVision - Journey of Discoveries. 6:00-8:00 pm In a safe and nurturing circle we’ll journey into the dream real aided by the sound of the drum and didgeridoo. You’ll learn what the soul wants, where it has gone and can go. This can reveal wishes of the soul, sacred contracts, knowledge & help of guides and spirits. Questing for self-healing and transform soul wounds from grief, pain, anger, and shame into sources of power and wisdom. Wellness Within, LOCATION Prana Blessings 1925 Rosina St., Unit C, Santa Fe RSVP Laurie Wheeler 505-772-0970 Donation $45 - bring a journal & blanket. markyourcalendar SUNDAY, APRIL 28 HEALING OUR PARTS! Horses Can Lead The Way – By appointment. Horses can lead the way through your self-doubt and lack of clarity. Experience equine guided healing, a powerful alternative coaching/counseling approach, with Lynn Clifford, LMHC. No experience needed; all unmounted. 505-231-5353. LynnClifford.com. Baba, one of the great Self Realized Yogis of our era, will be visiting Albuquerque on May 11th and Santa Fe on May 15th on a world tour, conducting free meditation classes, answering questions on self-realization, meditation and finding inner peace. see ad on page 10 for more details. sunday Transitions Radio Magazine – 9-10am. Celebrating the Voices of Love and Presence for 34 years. Whole Brain Radio with insightful, empowering interviews and stimulating and relaxing music tracks. Shows archived at TransRadio.com. Free. KBAC 98.1 FM. 505-670-1167. TransitionsMedia.com. wednesday Qigong & Healing From Within - 10:30am-12pm. Taoist, Yogic & Shamanic practices cultivate vitality, inner strength & awareness with energy healing, movement, sound, breathwork & meditation. $15, free/first class. Allison Lasky. We’re moving. Call for location, Santa Fe. 505-984-8733, AllisonLasky.com. saturday Qigong in the Park – 9-10am. Enjoy a vitalizing Qigong practice with certified Qigong instructor Loretta Shiver. Free. Altura Park, Morningside & Hannett NE, Albuquerque. 505-681-1924. QigongInThePark.com. Rates are monthly and charged the month prior to publication. Terms are consecutive months. Taxes will be applied. Are you ready to attract sustainable love that lasts? Contact me to discover and transform the patterns that are keeping you from experiencing the relationship you want. Access Bars is a lovely, hands-on healing technique that quiets your mind and slows down your brain waves allowing you to become more present and selfaware. Would you like to try it? Let’s chat! Jeanie McDuffee Certified Aromatherapist AllsWellAromatherapy.com 505-228-2950 Albuquerque Check out our website for custom essential oil blends to enhance your physical, mental and spiritual health. These are proprietary blends formulated by Jeanie using only natural ingredients and highly therapeutic essential oils. Give it a try, see website for specials. 2119 Gold Ave SE, Albuquerque 505-247-1338 • Light.org Learning your personal astrology is fun in the casual environment of our discussion group. We blend Hermetic Astrology with Egyptian Tarot. Beginners thru advanced are all welcome. Donations accepted. Come join us on the 1st and 3rd Sunday of every month at 11am for a lively discussion of what makes you unique! See our ad for more detail. We’re proud to offer the highest quality earth-based medicine and high frequency wellness products for human and animal health, healing, growth and evolution. We provide certified organic full-spectrum regionally-sourced CBD (cannabidiol) products, essential oils, flower and gem essences, stones and semi-precious gems, high frequency tools, sound healing supplies, artwork, clothing, jewelry, books and other wellness products. See our ad for more detail. Relaxing bodywork massage using complementary topical CBD to ease pain and further extend the benefit of the session for lasting comfort. Sometimes we do not have the tools to be healthier and happier. Let me coach you through your health & wellness journey. As a health and wellness coach, I will help you through the process of creating a vision for your health and overall wellbeing. By developing the vision you can start to manifest a healthy mindset and together we can sort through habits and strengthen those that match your goals. Deep Craniosacral Healing Work 505-918-1524 - Albuquerque www.craniowaves.com tom@craniowaves.com Heartful touch helping you move through difficult spaces: stress, anxiety, sleep issues, back/neck/shoulder/hip pain, headaches, recovery from lingering illness/injury, all things emotional, and much more!!! Sonia Masocco Phytotherapy is a herbal practice & apothecary specializing in Ayurveda and Clinical Herbalism. We carry a wide variety of herbs, tinctures, distillates & preparations and we fill custom orders. Leila G. von Stein Jesse R. Thomas Escobosa, NM BlueDesertHale@gmail.com • BlueDesert.org Offering classes and sessions in Massage and Bodywork, CranioSacral Therapy, Ayurveda and Marma Therapy and Reiki. Space also available for groups. Offering clean-crafted wines from small family vineyards around the world. No added chemicals, sugar or sulfites. Wine as nature intended, delivered to your door. Holistic Medicine at its Finest. Treating complex medical conditions with Acupuncture, Chinese Herbology, Homeopathy, Thermography and Jyotish. Massage and Energy Work by Leahn Cox, LMT. See our ad for more detail. Improve your diet, lifestyle and attitude. Using evidence-based holistic principles learn how to develop a personal plan for health and wellbeing. Initial 30-minute consultation FREE. Find clarity, insight and inspiration! Intuitive readings, coaching and animal communication. Clarify life choices and decisions. Activate practical solutions for your health, relationships, career and business.In-person and by phone consultations available by appointment. 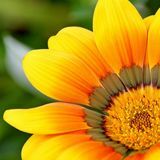 Homeopathy, Gemmotherapy, Rife therapy, shamanic healing/coaching, medical intuition, soul retrieval and flower essences. You may be facing some type of emotional or physical pain - with minimal understanding or relief. I’ve worked for over 24 yrs. with success in these modalities. Working with people of all ages - young and older, from colds to cancer - and specializing (but no limited to) the endocrine system. See ad and monthly calendar event. See our ad for more detail. Cate Clark, LMT Albuquerque - 505-401-4015 RiverStoneCate.com Lusciously Integrated Hot Stone Massage to melt away the over-stimulations of a frantic world! Fragrance-free and non-judgmental, your Sea of Tranquility is located east of Old Town in quiet, historic neighborhood. Empathic Bodywork and Highly Sensitive Massage since 1991. 2325 San Pedro NE Albuquerque JasonShanley.com EXPLORE A PAST LIFE! Natural solutions for all your challenges! Past life regression therapy is fun and healing. Certified Medical Support Clinical Hypnotherapist IBH # F10317-476. Free consultations 505-252-7433. Chantal Fidanza 505-438-1074 - Santa Fe YourDivineLight.biz Offering Intuitive Guide Certification, Tele-courses, Intuitive Healing Sessions, and Empath Support (both with and without equines) at my peaceful, mountain-view setting, or via phone. Everything I teach I continue to walk on my own path and offer with the intention of empowering others to anchor their divine light and trust their own inner wisdom. Special support for empaths, those particularly sensitive to energy. Discounted Session Packages for ongoing support available. See our ad for more detail. Your Authentic Life Coaching & Counseling 505-231-5353 - Santa Fe LynnClifford.com In this beautiful yet busy world, experience unique transformation, where authenticity and self-care serve as your compass; compassion and curiosity guide your way. Sessions connect people with their optimal selves via inner guidance, creative process, the natural world, and/or other sentient beings, including horses. (Unmounted. No experience needed.) Phone, Skype and in person. See our ad for more detail. 505-216-9686 1300 Luisa St, Ste 1, Santa Fe 505-257-3733 3600 Cutler Ave (Green Jeans), ABQ 505-336-0900 616 San Mateo Blvd. NE, ABQ 505- 257-3747 642 S Alameda, Las Cruces 505-300-0154 SacredGardenNM.com Sacred Garden takes pride in growing cannabis as a safe alternative to pharmaceutical drug therapies. Applicable for a wide spectrum of medical conditions, cannabis has assisted the health of countless people. We offer many different delivery methods, such as flowering buds, edibles, concentrates, oils, tinctures and salves. Our heart-based staff will help you find what works best for you and your needs. LaGina Glass 505-772-0171 Santa Fe PranaBlessings.com Metaphysical Shop and Healing Hub. Offering products and services for healing support. Spaces available to rent for events, classes, workshops, meetings and or private healing. Coryelle Kramer is known throughout the country as a prolific Professional Intuitive. She utilizes her psychic abilities, her guides and the ancient tarot in order to see and relay answers on such subjects as: career, love life, relationships, life purpose, current situations and future outcomes.Her readings are always giving with compassion and can be uplifting, empowering, honest, fun and extremely accurate. See our ad for more detail. Santa Fe Soul Center For Optimal Health 2905 Rodeo Park Dr, East Bldg #3 Santa Fe •RobynBenson.com/gift Regenerative medicine is the reverse of aging and degenerative disease. It’s the science of boosting healing naturally in damaged tissues and in under-functioning endocrine and immune systems. This is being achieved with nutrition therapy, stem cells and oxidative medicine (ozone and high dose vitamin C IVs). It also includes restoring healthy joints, hair growth, skin rejuvenation and sexual function with your own platelet rich plasma (PRP). See our ad for more detail. Jan Walker, Reiki Master Teacher and Healing Practitioner 505-835-5440 - Albuquerque AwakeningSpiritMinistries.org If you are dealing with the daily stresses of life or a major health challenge, Reiki can help. Reiki’s restorative qualities bring warmth, calmness, balance and a sense of well-being. Reiki classes offered every month. Shamanic healing, Intuitive counseling, Craniosacral therapy. Safe, effective support when healing from physical or psychological trauma or when struggling with transition. Relief from feelings of emotional stress,fear, and sadness. Guidance when searching for clarity or deeper meaning in life. In greek, Doula means mother to the mother. As a Doula, I offer prenatal consultations, labor and delivery assistance, and postpartum services. Happy Birthing to You! Reverend Shaman Sandra Chestnutt 575-779-4253 SandyChestnutt@gmail.com Facilitating Shamanic Healing ceremonies for over 20 years. Spiritual Guidance, House Clearing, and Apprenticeship program also offered. Open 7 days/eves.See our ad for more detail. Cannabidiol (CBD) helps with arthritis, digestion, seizures. Dropper bottles and creams. Order from the website or call me. For your Family and Pets. Through the gift of the voice and clairvoyance, Inès performs intuitive readings and uses toning to open the heart, remove ancient blockages and clear chakras. 970-222-2710 - Santa Fe DivineAlignmentBodyWork.com HealingSulfur.com Life-changing bodywork which restores the natural alignment of the body to feel grounded, empowered, and at ease. Be free of chronic pain with results that last! Also offering Craniosacral Therapy and therapeutic massage. See our ad for more detail. Singing feels good and is good for us! Allowing oneself the joy of singing brings life altering benefits. Do you allow past wounds to affect your relationship with your voice? Come explore, play, gain confidence and expand your joy quotient. Group Lessons, Vocal Improvisation Classes and Community Circle Singing in the Bobby McFerrin tradition. Email us for updates and events.Check calendar listings. Copper in new device prevents cold and flu last holidays,” she said. “The kids had colds going around, but not me.” Some users say it also helps with sinuses. Attorney Donna Blight had a 2-day sinus headache. When her CopperZap arrived, she tried it. “I am shocked!” she said. “My head cleared, no more headache, no more congestion.” Some say copper stops nighttime stuffiness if used just before bed. One man said, “Best sleep I’ve had in years.” Copper may even stop flu if used earNew research: Copper stops colds if used early. ly and for several days. Lab technicians ew research shows you can went away completely.” It worked again placed 25 million live flu viruses on a stop a cold in its tracks if you CopperZap. No viruses were found alive every time he felt a cold coming on and take one simple step with a soon after. he hasn’t had a cold since. new device when you feel a cold about People have used it on cold sores He asked relatives and friends to try to start. and say it can completely prevent ugly it. They said it worked for them, too, so Colds start when cold viruses get in outbreaks. You can also rub it gently he patented CopperZap™ and put it on your nose. Viruses multiply fast. If you on wounds, cuts, or lesions to combat the market. don’t stop them early, they spread in infections. Soon hundreds of people had tried it your airways and cause misery. The handle is curved and finely texand given feedback. Nearly 100% said But scientists have found a quick tured to improve the copper stops way to kill a virus. Touch it with copper. colds if used withcontact. It kills in 3 hours after the Researchers at labs and universities germs picked up first sign. Even up agree, copper is “antimicrobial.” It kills on fingers and microbes, such as viruses and bacteria, to 2 days, if they hands to protect still get the cold it just by touch. you and your That’s why ancient Greeks and Egyp- is milder and they family. tians used copper to purify water and feel better. Copper even heal wounds. They didn’t know about Users wrote kills deadly germs Sinus trouble, stuffiness, cold sores. that have become viruses and bacteria, but now we do. things like, “It Scientists say the high conductance stopped my cold right away,” and “Is it resistant to antibiotics. If you are near of copper disrupts the electrical balsupposed to work that fast?” sick people, a moment of handling it ance in a microbe cell, destroying it in Pat McAllister, age 70, received one may keep serious infection away. It may seconds. as a gift and called it “one of the best even save a life. Tests by the Environmental Protecpresents ever. This little jewel really The EPA says copper still works tion Agency (EPA) show germs die fast works.” Now thousands of users have even when tarnished. It kills hundreds of on copper. Some hospitals tried copper stopped getting colds. different disease germs so it can prevent for surfaces like faucets and doorknobs. People often use CopperZap preserious or even fatal illness. ventively. Frequent flier Karen Gauci This cut the spread of MRSA and other CopperZap is made in the U.S. of used to get colds after crowded flights. illnesses by over half, and saved lives. pure copper. It has a 90-day full money Though skeptical, she tried it several The strong scientific evidence gave back guarantee when used as directed times a day on travel days for 2 months. inventor Doug Cornell an idea. When to stop a cold. It is $69.95. Get $10 off he felt a cold coming on he fashioned “Sixteen flights and not a sniffle!” each CopperZap with code NATA10. a smooth copper probe and rubbed it Businesswoman Rosaleen says when Go to www.CopperZap.com or call people are sick around her she uses Cop- toll-free 1-888-411-6114. gently in his nose for 60 seconds. “It worked!” he exclaimed. “The cold perZap morning and night. “It saved me Buy once, use forever. 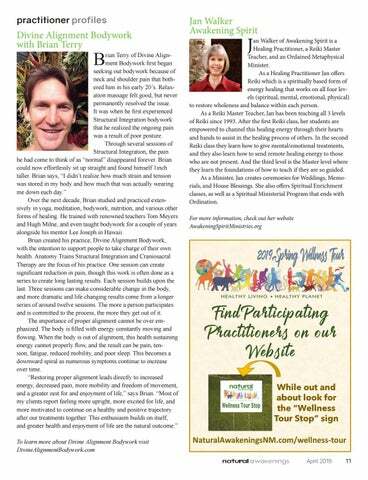 Get to know Brian Terry of Divine Alignment Bodywork in Santa Fe.